TheGunBlog.ca — Here are some people, products, companies and humour that caught my attention this week at SHOT Show, the world’s biggest trade expo for the firearm industry. More than 60,000 people from over 100 countries attended the show this year, the organizers said. My experience at the Military/Law Enforcement Range Day is here. Disclosures are at the end. Q: What is the formula for the correct number of guns you should own? A: n + 1, where n is the number of guns you own now. Newer models of their red-dot sights look like older ones, but they are more durable, more compact and have fewer moving parts, the sales rep said. Roughly, they are half the size and twice the price. The new CompM5 is based on the Micro T2, and uses widely available AAA batteries that light the always-on dot for five years. Aimpoints ship with Duracell batteries. 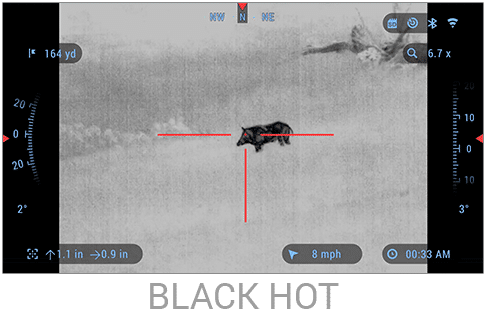 It might not be long before thermal-imaging rifle scopes become the norm. ATN’s models start at U.S.$2,000 and weigh about as much as traditional glass scopes, plus they work at night, calculate ballistics, record video, offer one-shot zeroing, and more … as long as they have electricity. Armasight, Flir and Pulsar are the company’s main competitors. The annual reception hosted by the shooters-rights group with the industry group is the biggest annual gathering of Canadian firearm professionals. You meet retailers, manufacturers, distributors, trainers, lawyers, advocates and media. TheGunBlog.ca was invited as media. The company makes most of its clothing, packs and pouches in China, and now makes some of its Elite line in the U.S to bid for U.S. government contracts. The staff was eager to show me the Trekker Pack, the Orion Assault Pack and the Solveig Assault Pack Gen II. 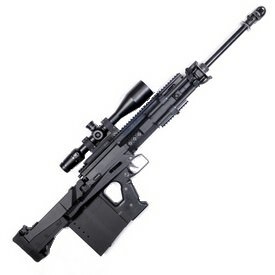 Many people, including long-range precision shooters, are eager to test the new bullpup Micro Dynamic Rifle in 7.62 NATO. It felt more back-heavy than the new IWI Tavor 7 in the same calibre, even though the MDR is a few millimetres shorter and a few grams lighter. I’ve never shot using their holographic sights. The company’s website provides a chart comparing them to red-dot sights, such as Aimpoint. The maker of the new .224 Valkyrie cartridge said interest in the round is high. One of the most important aspects of designing new ammo is getting firearm-makers to build guns that will fire it, the rep said. More than a dozen are on board, including Barrett, JP Enterprises, LaRue Tactical, LMT, LWRC International, Mossberg and Savage Arms. If you can’t decide between a curved or a flat trigger for your AR-15, the company’s Super Tricon trigger for AR-15 rifles combines both, and has a ribbed surface. 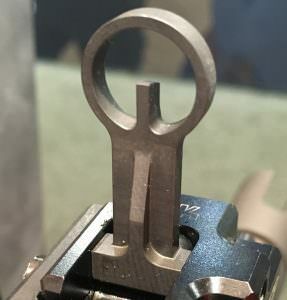 It seems like a good alternative to the popular Super Semi-Automatic Trigger. 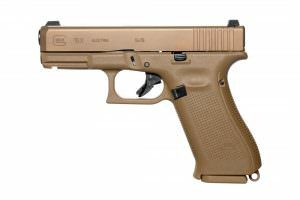 The new Canadian edition of the model 19 Gen 4 pistol was one of the stars of the Glock booth. Demand for this handgun will help the company decide whether to make more Canada-specific models. The new 19X feels and looks good in my hands. Some reviewers found the updated trigger mechanism to be smoother and crisper than Gen 4 models, but I couldn’t tell much of a difference. Still mushy Glock. And I still want one. Some new guns can be bought with Ameriglo sights, a nice alternative to the standard plastic sights. The company sells clothes, patches and paraphernalia to raise awareness and funds for soldiers who were injured or killed while working in “bad lands.” A team at the Military/Law Enforcement Range Day wore their products. It was my first time seeing their front sight consisting of a post in a circle. It was on an HK 433 rifle. I want to see if it’s as easy to aim at the range as at the booth. I’ve mainly shot with open or half-open front sights, like on standard AR-15 and AK-47 rifles. The rep at the Laser Shot booth told me about this website with a free downloadable program of Hunter Education Tools. The few pages I saw made me want to learn more and reminded me of the course for my hunting licence. The website redirects to HunterCourse.com and says it’s owned by Ottawa-based Fresh Air Educators Inc. The company makes match-grade barrels for precision bolt-action rifles and AR platforms. They weren’t presenting at the show, but I met one of their advisers, Ryan Steacy, at the reception of the Canadian Shooting Sports Association. Steacy is the first person in history to win the Dominion of Canada Rifle Association’s service-rifle championship four years in a row. He used a barrel he helped design. Besides making sights for Henry Repeating Arms and Marlin Firearms, the company makes a tactical garment bag that can hold 200 lbs. (90 kg) of gear and makes a .44 Magnum survival-rifle kit called the Bush Pilot. This series of colouring books by the publisher of Small Arms Review is perfect for kids, as well as adult policymakers in Ottawa and anti-gun activists in Montreal. 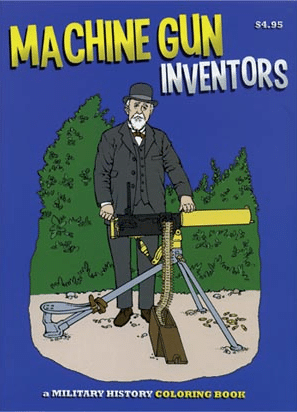 The collection includes: Why Daddy Serves His Country, Machine Gun Inventors, and one each for machine guns of World War I and II. The staff said they cost U.S.$2.95 each, not U.S.$4.95 as indicated on the cover. The Royal Canadian Mounted Police and Ontario Provincial Police, Canada’s two biggest police forces, use Streamlight gear. The company said the Pro-Tac is its most popular tactical light. The TLR-7 and TLR-8 are new models that allow the battery to be changed without removing the light from the accessory rail. When I asked the company’s chief mechanical engineer for his favourite light, he said it didn’t exist yet and that he and his colleagues were working on it. Then he reached into his pocket and showed me the Stiletto rechargeable flashlight he uses for everyday use (not yet on website), and said his favourite handgun light is the X300. The Stiletto is also one of the company’s cheapest models at about U.S.$110. His third mention was the FirePak, which will be reduced to U.S.$150, can connect to your phone, recharge it and light up the night with 1,500 lumens. The company, based in the Toronto suburb of Mississauga, showed me the GM6 Lynx, a .50 BMG bullpup precision rifle with a retractable barrel. The gun is made by Sero in Hungary and sells for $15,000. I took a shaky video of Neil Stephens presenting it. Tactical Imports also carries China’s Type 81 rifle, which Stephens described as the closest you can get to an AK in Canada without a “Prohibited” firearm licence. The company was acquired a year ago by Beretta Holding SpA and makes high-end precision rifles for combat, sport and hunting. Many plastic-framed pistols have been designed since the PPQ was released in 2011, but the PPQ still fits my hands the best, and has one of the nicest triggers. Seen: Shane Coley, Chris Costa, Rob Furlong, Julie Golob, Todd Hodnett, Rob Leatham, Jerry Miculek, Rob Pincus. There were many more who I didn’t see. I attended SHOT Show as media at no charge. I covered all expenses related to the trip. I want everything on this list. More disclosures here. Correction, 29 Jan.: Corrects manufacturer of Type 81 rifle in Tactical Imports section.